The Milwaukee civil disorder of 1967, often referred to as a riot, began on the evening of Sunday, July 30. By the following morning, confrontations on the city’s streets had essentially ended. Its brevity was the result of rapid, muscular responses by Milwaukee police, Mayor Henry Maier, and Wisconsin governor Warren Knowles, who sent in National Guardsmen. A street-clearing rain early the next day aided these countermeasures by public safety officials. The triggering events were scuffles between African American youth and police late Sunday, particularly along the “Inner Core’s” 3rd Street. These quickly escalated into window breaking, some arson and looting, and sporadic incidents of gunfire. Early Monday morning, Mayor Maier declared a state of emergency, placed the entire city under a twenty-four hour curfew, and called for National Guardsmen, 500 of whom soon sealed off the riot area. These actions effectively contained the disturbance to the African American “Inner Core,” from Michigan to Capitol avenues and from Holton to 20th streets. By Monday 4:50 a.m., Police Chief Harold Breier announced: “Everything quiet.” The curfew was lifted on Wednesday. Four deaths were attributed to the riot: a police officer and an African American youth were fatally shot. An elderly white woman was the victim of a random bullet as she lay in bed, and a lethal heart attack was also blamed on the riot. By comparison the riots in Detroit (1967), Watts (1964), and Newark (1967) experienced forty-three, thirty-four, and twenty-six deaths, respectively. In Milwaukee, approximately 100 were injured. There were 197 arrests for “serious offenses.” Active riot participants, at any given time, generally numbered around 300-350. Property damage was estimated at $570,000. Given the relatively limited gunfire and fatalities, the disturbance can be more accurately described as an explosion of rage and vandalism than urban guerilla warfare. In the aftermath, Mayor Maier was a hero to white Milwaukeeans. Critics, however, noted that he proposed no new programs to deal with blacks’ grievances. ^ Milwaukee Journal, July 31, 1967. ^ Karl Flaming, “The 1967 Milwaukee Riot: A Historical and Comparative Analysis” (Ph.D. dissertation, Syracuse University, 1970), 29, 43-48; Patrick D. Jones, The Selma of the North: Civil Rights Insurgency in Milwaukee (Cambridge, MA: Harvard University Press, 2009), 144-46. ^ Flaming, “The 1967 Milwaukee Riot,” 29-31, 81; Jones, Selma of the North, 145-48; Milwaukee Journal, August 1, 1967. ^ Flaming, “The 1967 Milwaukee Riot,” 31-40, 52, 88, 100-03, 125-38; Jones, Selma of the North, 148-61; Milwaukee Journal, July 31, 1967; Ruth Zubrensky, A Report on Past Discrimination Against African-Americans in Milwaukee, 1835-1999 (Milwaukee: Ruth Zubrensky, 1999), 51, Golda Meir Library Archives, University of Wisconsin-Milwaukee. ^ Frank Aukofer, City with a Chance (Milwaukee: Bruce Publishing Co., 1968), 20; Bill Dahlk, Against the Wind: African Americans and the Schools in Milwaukee, 1963-2002 (Milwaukee: Marquette University Press, 2010), 131-32; John Gurda, The Making of Milwaukee (Milwaukee: Milwaukee County Historical Society, 1999), 374; Jones, Selma of the North, 163-67; Milwaukee Journal, August 3, 19, 1967. Flaming, Karl. 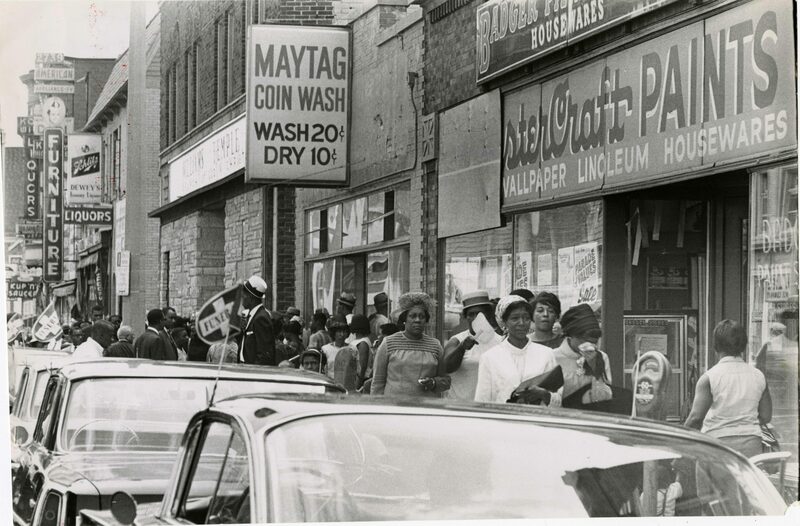 “The 1967 Milwaukee Riot: A Historical and Comparative Analysis.” Ph.D. diss., Syracuse University, 1970. Jones, Patrick D. The Selma of the North: Civil Rights Insurgency in Milwaukee. Cambridge: Harvard University Press, 2009.